Interview with Alex Fallstrom! | Not Your Average Hockey Blog. Got a question, comment, or just want to talk? Leave us a comment below! So first things first, what’s your day been like? My day has been good so far, grabbed a light lift this morning and then I ran some errand preparing for my parents coming in for graduation next week. People know Alex Fallstrom the name, but not Alex Fallstrom the person, maybe a little autobiography with a cool fact about you? I was born and raised back in Sweden, and there I started playing hockey when I was around 7 years old. Then I moved to Faribault, Minneosta to attend Shattuck St.Mary’s High School for two years where I ended up getting drafted by the Minnesota Wild at the end of my senior year. Then for the past four years I’ve been going to school and playing hockey at Harvard and I’m graduating next Thursday. After our season I was fortunate enough to fulfill a childhood dream of mine when I signed a professional contract with the Boston Bruins, and went down and played some games with their minor league affiliate Providence Bruins. What are you planning to major in at Harvard? I majored in Economics at Harvard. As a child, was there one player you looked up to growing up? When I grew up I always looked up to Daniel Alfredsson. We interviewed your teammate Jimmy Vesey a few days ago, and he told us you’re the team DJ? So you must have lots of music pumping up the room, whats the Crimsons’ music of choice? I took over after Chad Morin as the team’s DJ during my freshman year, and since then I’ve been in charge of the music in the locker room since then. During the weeks before and after practices it’s mainly country that’s playing from my iPod, but on game days it’s mostly house music that I’m playing. A lot of Swedish house, music by fellow Swedes like the Swedish House Mafia, Avicii, and Alesso. Real good stuff. Now I’ve passed over the DJ torch to Tommy O’Regan. He also told us you’re a terrible dancer too, so its your turn to expose a secret about him! What’s one embarrassing secret about Jimmy Vesey you’d like to share? When you’re in North America, is there one thing you miss about home? I miss my family and friends a lot, and then the home cooked meals. My mom is an awesome cook so I miss her food a lot. Not staying in touch with some people from back home and from high school during the time I’ve spent here at school. Your teammate Luke Greiner is from the same High School, (Shattuck-St. Mary). Did you guys make your decision together or was it just a coincidence? 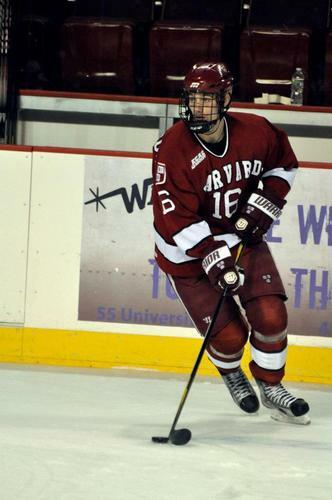 Greins was a grade above me at Shattuck and he committed a year before me, so he was definitely a big reason in my decision to come to Harvard. What has been your biggest highlight of your career? Getting drafted my senior year at Shattuck, and the signing my first professional contract with Boston earlier this year. My lowest point was probably when I got cut from the Swedish national team before world juniors. I didn’t let it bring me down so I just trained and worked even harder to prove to them that it was a mistake to not put me on the team. Next round is a lightning round! I don’t want you to think. Just answer. READY? Medium ice coffee at Dunkin every time I walk down to the rink before games. Long bus ride, what are you doing? Listening to my iPod or watching movies on my computer. What are you answering this with? Play any other sports growing up? One class you hated in school? Never stop chasing the dream, it might just be around the corner. Danny Biega, Luke Greiner, Conor Morrison, Marshall Everson.